London is one of the world's greatest cities. Diverse, ethnically and linguistically, it offers an intoxicating mix of grandeur, history, style and culture. From ancient streets, leafy parks and grand architecture to iconic landmarks, neon lights, world class shopping and a cool arts scene, there's nowhere in the world quite like this thriving metropolis. Known as Londonium to the Romans, London has been a major settlement for two millennia. The City of London is the capital's 1.12 square mile historic nucleus and modern financial center and often is referred to as the "Square Mile." The rest of London stretches for a remarkable 30 miles on both sides of the River Thames. Contemporary museums, such as the Tate Modern and Saatchi Gallery, add an option to beloved standards like the Victoria and Albert Museum (better known as the V&A) and the National Gallery. You can splurge on Saturday morning along Portobello Road or stroll Jermyn Street for gentlemen's shops bearing royal warrants. (Prince Charles gets his pajamas at Turnbull & Asser.) But it's also fun to join the flocks of shoppers at fashion-forward boutiques along New Bond Street, Regent Street or -- less expensively -- within the markets and funky shops of Brick Lane in the East End. Visitors typically spend most of their time in and around the West End, where London's main attractions -- Piccadilly Circus, Charing Cross Road's book shops, Covent Garden, Soho, Regent and Oxford Streets, Trafalgar Square, Leicester Square, Carnaby Street -- are located. Farther west are the pricier neighborhoods of Belgravia, Kensington (Kensington Palace, Albert Memorial, Royal Albert Hall), South Kensington (Science Museum, Natural History Museum, Victoria and Albert Museum), Knightsbridge (Harrods, Harvey Nichols), Mayfair, Chelsea (Kings Road) and Notting Hill (Portobello Road). The City of London's financial district (home to St. Paul's Cathedral, Fleet Street, Tower of London) is a must for history lovers. In medieval times, the City constituted most of London, but over the years, urban areas sprawled far beyond. As the City's boundaries have remained almost unchanged since the Middle Ages, it is now only a tiny part of the metropolis, though holds city status in its own right. London is a major port of embarkation and debarkation, although few ships actually dock near the city center. The city is linked to five different ports, all of which are commonly referred to as "London" by the cruise industry. The ports of Southampton and Dover are each located about 80 miles from downtown London (southwest and southeast, respectively). These ports handle the larger ships carrying 2,000 passengers or more; see the individual port profiles for travel hints and tips. 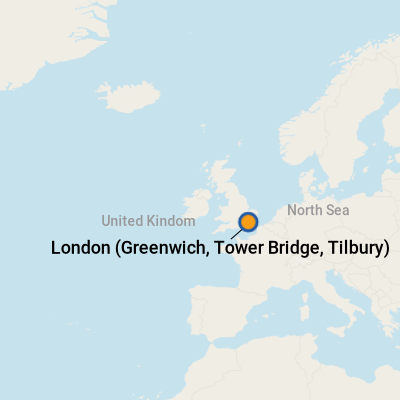 The Port of Tilbury is 25 miles east of central London, near the mouth of the Thames, and home to a purpose-built cruise facility, the London Cruise Terminal. Tilbury is situated less than an hour from the London City or Gatwick airports, but about 90 minutes from Heathrow Airport by car or coach. Links into town have been improved with the Thames Clipper, fast catamaran river buses carrying 220 passengers, taking 50 minutes to reach Tower Bridge. But two ports are located near the heart of London, and if you are lucky enough to be docking at Tower Bridge or Greenwich it means you're on a small, luxury vessel. Tower Bridge is the most scenic place to dock, with the Tower of London and the City easily accessible by foot. There are also fashionable shops, restaurants and delis at Butler's Wharf on the south bank. Greenwich, a fascinating, historic suburb, is within easy reach of the West End. Greenwich is a great place to be moored; the Greenwich Observatory, National Maritime Museum, Cutty Sark and the shops and weekend market are just minutes away on foot. Tilbury does not have too many facilities for passengers. There is an information desk, a cafe/restaurant in the passenger lounge, a small general store, free Wi-Fi and public pay phones. A taxi rank is immediately adjacent to the terminal. The nearest ATMs are in Tilbury's town center or Asda Supermarket, about one mile away. There is not a great deal to see round Tilbury, though Tilbury Fort is worth a look. It is one of the U.K.'s finest examples of 17th century fortifications and is near the site where Queen Elizabeth I rallied her troops to face the Spanish Armada in 1588. Tilbury owns a couple of claims to fame other than the royal association. In the remake of "Alfie," scenes of what was supposed to be Pier 49 in New York were actually shot at Tilbury, and scenes from the 1989 movie "Indiana Jones and the Last Crusade" were filmed there, too. In 1948, SS Empire Windrush docked at Tilbury, bringing Caribbean migrants. The arrival was seen as pivotal in the emergence of modern multicultural Britain. London is a big, crowded city, and like other big cities, petty crime is common. Take care of your bags and belongings at all times. On Foot: Walking is a great way to get around London. Look out for black and yellow street signs and maps -- they give useful information about the area, including key landmarks, with realistic five- and 15-minute walking times. By Subway: Because distances between points of interest can be too far to reach on foot, there is always an Underground station within reach. Tourists can recognize locations by means of the Tube's logo, "the roundel," a red circle crossed by a horizontal blue bar. The Tube is hugely efficient and the world's oldest underground railway. The nickname originally applied to the Central London Railway, which was called the Twopenny Tube because that was the fare, besides the fact it had cylindrical tunnels. Now it refers to the whole system. Fares are considerably more since then -- in fact, the Underground is one of the most expensive in the world if you choose to pay with cash. The cheapest ways to use it are either to pay as you go with a touchless credit or debit card, or purchase an Oyster card and load it up with credit. Made up of 11 lines (plus the separate Docklands Light Railway), six zones and hundreds of stations, many Tube stops are within steps of major attractions and shopping districts. For the most part, the service is very good with trains running every few minutes on most lines. On Tube escalators, remember the unwritten rule, "stand on the right, walk on the left." Note that many of the older stations in the heart of the city are not wheelchair accessible, all of which are identified on Tube maps. Services run regularly from around 5 a.m. to midnight on most routes, with overnight service on some lines over the weekend. Check www.tfl.gov.uk for details. Avoid morning or evening rush hour if possible -- before 9:30 a.m. and between 4:30 p.m. and 6:30 p.m. Note: The shortest distance between two stations on the Underground network is 260 meters (853 feet). The journey between Leicester Square and Covent Garden on the Piccadilly Line takes around 20 seconds but costs £4.30. It remains the most popular journey with tourists -- many of whom don't realize it's better to walk the short distance. By Bus: London's buses are a little more complicated to navigate, but they have the added incentive of letting you see the city through their windows. Bus routes good for sightseeing are the No. 11 (the City, St. Paul's, Fleet Street, Trafalgar Square, Parliament Square, Houses of Parliament, Big Ben) and the No. 9 (Hyde Park, Knightsbridge, Piccadilly Circus). Another more touristy way to get around is by hopping aboard any one of many double-decker tour buses. Some allow you to get on and off over a 24-hour period, making it one of the best ways to see the sights. The Big Bus Company offers several routes, with either a live guide or recorded commentary and the opportunity to cruise between Westminster Pier and Greenwich. The company also offers three walking tours: St. James' Palace and Buckingham Palace, Harry Potter film locations and "Ghosts by Gaslight." Principal starting points are Baker Street Station, Marble Arch, Trafalgar Square, Green Park and Victoria Station. Tours run approximately every 10 to 20 minutes. The Oyster card is a plastic smartcard to use instead of paper tickets. It is preloaded with money for travel around London. The system automatically calculates the cost of each journey you make based on the service you use, when you travel and in which zone(s). Along with tapping in using your touchless bank card, Oyster is the cheapest way to pay for travel on bus, Tube, tram, DLR, London Overground and most National Rail services in London. Travel is more expensive during peak hours, Monday through Friday 6:30 a.m. to 9:30 a.m. and 4 p.m. to 7 p.m. London's public transport network is fully integrated, so it's easy to switch between services. Buying an Oyster card before you leave home makes it even easier to travel around. See www.visitorshop.tfl.gov.uk. When using the Tube, you need to validate your Oyster upon entering and exiting -- so keep it handy to exit at your destination. By Taxi: The drivers of London's famous black cabs -- which actually come in a variety of colors -- know every nook and cranny of the city. Cabs can be hailed in the street or at designated ranks, often in front of railway stations. If the yellow TAXI sign at the front is illuminated, the cab is available for hire. They are legally obliged to take on any job for journeys up to 12 miles (20 miles at Heathrow Airport taxi ranks). Fares are metered, and there is a minimum charge of £2.40. Additional charges apply on Christmas Day and New Year's Eve. Many black cabs accept payment by credit or debit card, but check with the driver before the trip starts. You can tip taxi drivers what you like, but most people round up to the nearest pound. All black cabs are wheelchair accessible and carry assistance dogs at no charge. Reputable, licensed minicab companies, though less regulated, can offer a cheaper alternative to the black cab. They should be booked at an office, by telephone or email. Their fares are not metered, so ask how much the trip will cost when you make a booking. Uber: Uber has been operating in London since 2012 but not without controversy; in 2018 the ride-hailing app was declared to be not a "fit or proper" operator. In June 2018, Uber was granted a probationary 15-month license to operate, with Transport for London watching the company's every move. The story of Uber's relationship with London will continue to unfold. The national currency is the pound sterling. Currency exchange can be made in airports, banks, post offices and travel agencies. For up-to-the-minute currency exchange information, go to www.oanda.com or www.xe.com. Traveler's checks should be exchanged at banks or exchange offices. For the best exchange rate, use ATMs, which are found almost everywhere. If you are visiting from outside the European Union, you can get back some of the VAT (Value Added Tax) you pay on certain goods. Not all shops participate, and stores that do set a minimum purchase level. You need to carry your passport with you and fill in a form at the time of purchase. Present the forms to customs officials at your final departure from the European Union, but keep in mind the agents probably will ask to see the goods. Visit www.globalblue.com for more information. English is spoken and understood everywhere, of course, as are many other languages. Obviously in a city as huge as London, visitors can find the flavors of the world at prices for every pocket. There are more than 50 Michelin-starred restaurants in London. Head to a pub where you will often get a satisfying lunch -- perhaps bangers (sausages) and mash, grilled chicken salad or fish pie for under £10. London also has some of the most exciting and diverse ethnic cuisine in the world. There is everything from Thai, Vietnamese, Japanese, Korean and Chinese (try Chinatown in Soho for the real thing), to Middle Eastern, Italian, French and more eclectic styles -- like Russian, Ethiopian and Syrian, for example. There are Indian restaurants everywhere, and you'll find south Indian, north Indian, vegetarian Indian, gourmet Indian. If you're going to the theater, check out the pre-show menus in restaurants around the West End. They're lighter and will be served in time for you to get to your seat before the show. Editor's Note: It's common practice for restaurants to add a service charge to your bill. If not, leaving 10 percent is customary, with a jump closer to 15 percent at posh places. There are plenty of take-out fish and chip shops, too, including the oldest surviving one in London, Rock & Sole Plaice. First opened in 1871, it isn't the cheapest fish and chip shop in town, but it has a cult following and indoor and outdoor seating (and rather tasty fish and chips, too). Expect to spend £20 and up for a meal of fish and chips, not including drinks. (Covent Garden, WC2; +44 (0)20 7836 3785; open 11:30 a.m. to 11:30 p.m. Monday to Saturday and noon to 10 p.m. Sunday). Traditional Cockney (East End) London food includes pie and mash, so for a touch of the authentic, go to Goddards at Greenwich. This is one of London's most famous pie-and-mash shops. It has been in business since 1890. Pie and mash is a meat pie with mashed potato and a green sauce made from parsley and the water used to cook stewed eels. Lunch or dinner here under £10. (King William Walk, SE10; +44 (0)20 8305 9612; open Sunday through Thursday 10 a.m. to 7 p.m., and till 8 p.m. Friday and Saturday). The menu changes daily at Hereford Road, a neighborhood restaurant on a street of the same name in Notting Hill Gate. Starters might be marinated smoked haddock, potato and horseradish, while main dishes include corned beef (salt beef), falafel, potato pancakes, hummus and imaginative salads, with plenty for vegetarians. Puddings like blueberry ripple ice cream or buttermilk pudding and cherries hit the spot. The 2-course set lunch menu is £13.50; dinner will cost you around £30. (3 Hereford Road, Westbourne Grove, W2; +44 (0)20 7727 1144; open noon to 10 p.m. daily). Gaby's Deli, which opened in 1964 and is still run by Gaby, is a hit with celebrities, penny pinchers, vegetarians, those looking for Jewish and Mediterranean offerings and more. You'll pay an about £15. (30 Charing Cross Road, WC2; +44 (0)20 7836 4233; open 11 a.m. to midnight Monday to Saturday and noon to 10 p.m. Sunday). Since it opened in 1828 as a coffee house, Simpson's-in-the-Strand has been a London institution. The restaurant is famed for its traditional English fare, especially roasts that are carved at guests' tables from antique silver-domed trolleys. A three-course meal starts about £50. Simpson's also serves a less-expensive pre-theatre menu Monday through Friday 5 p.m. to 7 p.m., and 9 p.m. to close. (100 Strand, WC2; +44 (0)20 7836 9112; open Monday to Friday for lunch noon to 2:30 p.m. and for dinner 5 p.m. to 11 p.m.; Saturday from noon to 11 p.m. and Sunday noon to 8 p.m.). One of London's best Indian Sunday lunch buffets can be found at Bengal Clipper, a restored warehouse that's walkable from Tower Bridge. The restaurant is open every day for a la carte dining. A stunning "Simple Indian Food Menu" lunch or dinner costs £12 per person. (11-12 Cardamom Buildings, Shad Thames, SE1; +44 (0)20 7357 9001; open noon to 2:30 p.m. and 6 p.m. to 11:30 p.m. Monday to Saturday and noon to 4 p.m. and 6 p.m. to 11 p.m. Sunday). If you want to spend your hard-earned cash on a souvenir from London, you have plenty of choices, from mugs featuring the royals, toy Routemaster buses and Union Jack cufflinks to tea towels with tube maps emblazoned on the front. If you're looking for something with a bit more taste and originality, head to Liberty of London on Regent Street, with its Tudor frontage, wooden balconies and glass atriums it is a sight worth seeing in its own right. The shop has its own distinctly British line in fabrics, so look for scarves or accessories. Harrods offers a good line in non-tacky gifts (see below), and Fortnum & Mason near Piccadilly Circus also has a lovely food section with lots of ideas for hamper gifts.